See some of the top sights in the city with this flexible itinerary package. 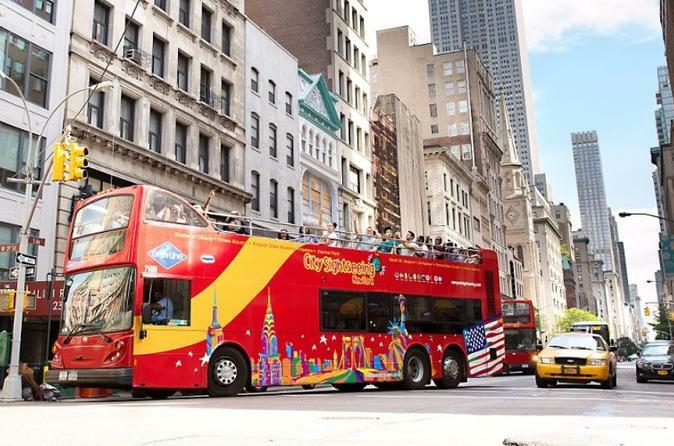 Start with a hop-on hop-off double decker downtown bus tour that boasts views of top landmarks and attractions like the Empire State Building, Times Square, and Central Park. Every tour also includes unlimited hop-on hop-off access, which means you’ll have the chance to explore attractions that are most important to you, at your own pace. Also included is admission to the Top of the Rock and the Museum of Modern Art. Begin your day with a hop-on hop-off double decker bus tour. Your tour begins in Times Square, home to some of the brightest lights and rarest sights in the Big Apple! Take some time to browse the shops, grab a bite to eat, or catch a street performance before boarding your tour bus. The tour continues south through lower Manhattan, while your friendly tour guides detail the rich history of Manhattan and point out all of the exciting sights along the route. Perched high above the city streets, double-decker buses offer some of the best views of famous landmarks such as the Empire State Building, the Brooklyn Bridge, Rockefeller Center, the Statue of Liberty, and more! Downtown Manhattan is home to some of the city’s most exciting neighborhoods, and with your unlimited hop-on hop-off option you can experience them all along the way! Stop off in SoHo, Greenwich Village, or Chinatown for a unique shopping experience that you can only get in Manhattan. Hungry? Hop off in Little Italy for some delicious pizza or Italian fare. Finally, Battery Park is an absolute can’t-miss for views of the NYC’s most iconic attraction, the Statue of Liberty. When you’re ready to continue your tour, just hop on the next bus to be on your way! A New York minute is all you need to discover two of the most impressive attractions in the city, the Top of the Rock Observatory and the Museum of Modern Art. At the “30 Rock” building in Rockefeller Center, the Top of the Rock Observatory offers stunning panoramic views of the skyline as well as innovative exhibits and larger-than-life displays. Three floors of observation decks provide thrill, romance and some of the best views in the city! At the MoMA, an exciting experience of a different kind awaits. This world-class museum is one of the most influential institutions of modern and contemporary art in the world. Its enormous collection includes some of the most praised works by Picasso, Van Gogh, Degas, Matisse, Klee, Cezanne, Chagall and thousands of other famous artists. To allow for greater flexibility, both your Top of the Rock and MoMA ticket is valid for one time use within 14 days of your departure date.